Bruno Latour‘s Gifford Lectures Facing Gaia: A new enquiry into Natural Religion, which were given at University of Edinburgh over the last few months are now on the web. Those six lectures in ‘natural religion’ explore what it could mean to live at the epoch of the Anthropocene when what was until now a mere décor for human history is becoming the principal actor. They confront head on the controversial figure of Gaia, that is, the Earth understood not as system but as what has a history, what mobilizes everything in the same geostory. Gaia is not Nature, nor is it a deity. In order to face a secular Gaia, we need to extract ourselves from the amalgam of Religion and Nature. It is a new form of political power that has to be explored through a renewed attempt at political theology composed of those three concepts: demos, theos and nomos. It is only once the multiplicity of people in conflicts for the new geopolitics of the Anthropocene is recognized, that the ‘planetary boundaries’ might be recognized as political delineations and the question of peace addressed. Neither Nature nor Gods bring unity and peace. ‘The people of Gaia’, the Earthbound might be the ‘artisans of peace’. The lectures are organized by groups of two, the two first ones deal with the question of Natural Religion per se and show that the notion is confusing because on the one hand ‘nature’ and ‘religion’ share too many attributes and, on the other, the two notions fail to register the originality of scientific practice and the specificity of the religious regime of enunciation. Once the pleonasm of Natural Religion is pushed aside, it becomes possible to take up, in the next two lectures, the question first of Gaia as it has been conceived by James Lovelock and of the Anthropocene as it has been explored by geologists and climate scientists. It is thus possible to differentiate the figure of the Earth and of the agencies that populate it from the notion of nature and of the globe thus bringing to the fore the geostory to which they all belong. In the last two lectures, after the notion of Natural Religion has been put aside, and after the complete originality of Gaia and geostory have been foregrounded, it becomes possible to reopen the political question at the heart of what will be life at the Anthropocene. Once the key question of war has been introduced, the search for a peace along the delineations allowed by politically relevant ‘planetary boundaries’ to which Earthbound (the new word for Humans) accept to be bound become again possible. As mentioned on Resilience Science previously, Canada’s CBC radio has a great accessible series – How to think about science – on science studies and philosophy of science, which includes an introduction to Latour and his work. On his blog “immanence“, Adrian J Ivakhiv, proposes an interesting list of the “books of the decade in ecocultural theory”. Please, check the whole list at his blog. The three first books are by (1) William E. Connolly on Neuropolitics, (2) Arturo Escobar on social movements and ecological-cultural dynamics, and (3) Graham Harman on Latour and metaphysics. He also lists several other interesting books that did not make it to the top ten, including books by Bruce Braun, Sarah Whatmore, Alf Hornborg, Donna Haraway, Tim Ingold, Bruno Latour, Doreen Massey, and John Law amongst several others. 1. William E. Connolly, Neuropolitics: Thinking, Culture, Speed (University of Minnesota Press, 2002) — This was the book that most coherently and provocatively connected together the entire set of interests I had been grappling with at the time — consciousness, neuroscience, affect/emotion, religious experience, the potentials of film and media, and, centrally, the possibilities for political and cultural change in our time. Connolly’s work in political theory has continually pushed far beyond the bounds of that field. 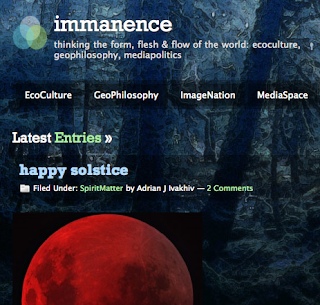 While his Pluralism and the forthcoming A World of Becoming may signify a certain fruition of his thinking, his articulation of the thickly entwined interconnections between biology and culture in Neuropolitics, under the rubric of “immanent naturalism,” provocatively set out a range of avenues of exploration, which this blog has been active in pursuing and documenting. 2. Arturo Escobar, Territories of Difference: Place, Movements, Life, Redes (Duke University Press, 2008) — A tremendous synthesis that places social movements — actual people doing things together to change their worlds — at the center of thinking for how the ecological-cultural dynamic is changing in our time. Other books of environmental anthropology (by Anna Tsing, Paige West, and others) and of political ecology (by Paul Robbins, Biersack and Greenberg, and others) could be on this list, but Escobar engages conversations across these fields and others in the most provocative and satisfying ways. 3. Graham Harman, Prince of Networks: Bruno Latour and Metaphysics (re.press, 2009) — While Harman’s Tool-Being and Guerrilla Metaphysics may be his more lasting philosophical contributions, this book, which first brought anthropologist of science Bruno Latour firmly into the ambit of philosophy, introduced me — and judging by internet activity, many others — to the growing movement of post-Continental-philosophical “speculative realism.” As a movement that tries to theorize the make-up of the world in ways that completely avoid traditional dualisms (culture/nature, society/ecology, etc. ), it’s a breath of fresh philosophical air, and one that has influenced the development of this blog much more than I could have known when I started it. [The blog is an] online space for environmental cultural theory, this weblog has two primary objectives: (1) To communicate about issues at the intersection of ecological, political, and cultural thought and practice [... and] (2) To contribute to the development of a non-dualist understanding of nature/culture, mind/body, spirit/matter, structure/agency, and worldly relations in general. As you might know, some of us at the Stockholm Resilience Centre are quite inspired by actor-network theory (ANT), an “infralanguage” to help us undermine the Nature/Culture (or Social/Ecological) dichotomy; a dichotomy that has divided academia for a long time, but which interdisciplinary institutes like SRC is trying to overcome. One of the key developers of ANT is coming to Stockholm, Bruno Latour, to give a lecture at the Nobel Museum entitled: “May Nature Be Recomposed? A Few Questions of Cosmopolitics” (The Neale Wheeler Watson lecture, Tuesday, 16-18). In many ways, ANT is ‘a way of writing’ academic (ethnographic) accounts so as to treat humans and non-humans (including species, water currents, machines, documents etc.) in similar ways. A classic study is that of Callon (1986), in which a bunch of marine biologists strive to save the population of scallops by introducing controlled scallop production mobilizing both fishers, scallops, technology, and water currents (but they ultimately fails…). In my own study of how a large green area of Stockholm got protected (and thus influenced the urban ecology of Stockholm), ANT inspired me to acknowledge that it was not only civil society activists that played a great role in managing to protect this green area, but also maps, buildings and species that got ‘enrolled’ into a protective story (Ernstson and Sörlin 2009). Others have used this in similar ways (e.g. Eden et al 1999). I believe more can certainly be done as we engage with this “infralanguage” (for instance how to understand the “politics of scale” in transformative change towards ecosystem management). In his lecture, Bruno Latour will talk about “cosmopolitics”. Most people would associate this term with that of being an internationalist, somebody with backgrounds in a lot places and nations, and with an open attitude to different cultures and the formation of new collectives. However, I suspect the talk will be about other types of collectives, those that stretch over the Nature/Culture divide, and that even prove that this divide is nothing more than an illusion (although a powerful illusion indeed). An intrerpretation of what Latour and others (especially Isabelle Stengers, Cosmopolitiques, vol. 1) understand as cosmopolitics is a “politics of the cosmos” that leads to the recognition of new “collectives”, a recognition that humans and non-humans are entangled and that we (the collective) need to respect this entanglement in order to live our lives. In our field of reserach, this idea has partly been captured in the concept “ecosystem services” (although in a more economistic fashion, see argument of a “social production of ecosystem services”; Ernstson, H., 2008, In Rhizomia. PhD Dissertation.Stockholm University, Stockholm.). Funny enough, and inspired by British geographers (Hinchcliffe, Whatmore et al 2005), I held series of lectures and a workshop with art and design students at the Stockholm School of Art and Design (Konstfack) on “Cosmopolitical Experiments“, i.e. how can designs evoke a sense of recognizing our entanglement with these other-than-human citizens that share our planet. To SRC and the broader field of social-ecological studies, ANT and similar attempts to undermine long held dichotomies that constrains our thoughts, methods and theories, are exciting to explore and engage. PS. The lecture at Nobel Museum will be broadcasted after the lecture on Tuesday, 16-18. If science is neither cookery, nor angelic virtuosity, then what is it? Modern societies have tended to take science for granted as a way of knowing, ordering and controlling the world. Everything was subject to science, but science itself largely escaped scrutiny. This situation has changed dramatically in recent years. Historians, sociologists, philosophers and sometimes scientists themselves have begun to ask fundamental questions about how the institution of science is structured and how it knows what it knows. Episode 4 – December 5 – Ian Hacking and Andrew Pickering A new generation of historians and philosophers have made the practical, inventive side of science their focus. They’ve pointed out that science doesn’t just think about the world, it makes the world and then remakes it. Science, for them, really is what the thinkers of the 17th century first called it: experimental philosophy. Episode 5 – December 12 – Ulrich Beck and Bruno Latour Few people ever apply a name that sticks to an entire social order, but sociologist Ulrich Beck is one of them. In 1986 in Germany he published Risk Society, and the name has become a touchstone in contemporary sociology. Among the attributes of Risk Society is the one he just mentioned: science has become so powerful that it can neither predict nor control its effects. It generates risks too vast to calculate. … Later in the hour you’ll hear from another equally influential European thinker, Bruno Latour, the author of We Have Never Been Modern. He will argue that our very future depends on overcoming a false dichotomy between nature and culture. Episode 6 – January 2 – James Lovelock In this episode David Cayley presents a profile of James Lovelock. It tells the story of a career in science that began a long time ago. Technological science exerts a pervasive influence on contemporary life. It determines much of what we do, and almost all of how we do it. Yet science and technology lie almost completely outside the realm of political decision. … In this episode we explore the relations between politics and scientific knowledge. David Cayley talks to Brian Wynne … one of Britain’s best-known writers and researchers on the interplay of science and society. Dean Bavington about the role of science in the rise and fall of the cod fishery.